Hyderabad based Mahindra Ecole Centrale (MEC) College of Engineering is organising an information session for B.Tech aspirants in Bangalore on Sunday, January 27, 2019. MEC will share details of admissions to the four year B.Tech programme at its Hyderabad campus for the academic batch 2019-2023 with prospective students and their parents. The MEC info session, which will be held at The Park, Mahatma Gandhi Road, Bengaluru between 10 am – 5pm, will have MECs admission team addressing queries of B. Tech aspirants. “We invite parents and prospective students to attend the counselling session and learn how Mahindra Ecole Centrale focuses on creating the “new engineer” and empowering them with the skill sets required to excel in the global arena”, says Rakesh Sreedharan, head – admissions and marketing, Mahindra Ecole Centrale. MEC has a total of 240 seats available in its B.Tech Programme – 60 each for the four courses offered – in Computer Science & Engineering, Electrical & Electronics Engineering, Mechanical Engineering and Civil Engineering. Mahindra Ecole Centrale’s markedly different, holistic education concepts for Engineering students will be showcased. MEC is an international quality technology school and focuses on career progression for engineering aspirants. Key aspects of education at MEC are the focus on multi-disciplinary knowledge, personality development, and critical-creative thinking. MEC is approved by AICTE and Jawaharlal Nehru Technological University (JNTU) Hyderabad, a premier institution with academic and research oriented courses. The aspirants and their parents will be taken through a comprehensive module that showcases the MEC differentiation. MEC students are more equipped to handle the needs of the future. MEC focuses on an integrated curriculum that ensures that the student is privy to the best practices, learns through “doing” and has the best of the industry to mentor him. In addition, the focus is on opening up or broadening their horizons by ensuring that they learn before they enter the classroom. The education delivery is more interaction-oriented and less discourse-oriented. The four-year B.Tech. Degree will shape students with the unique ability to adapt to global engineering challenges and adopt new technologies that would help redefine the future, at the same time creating professionals with the ability to master the complexities of multinational organisations. MEC’s vision is to train engineers, both men and women, to be entrepreneurial and innovative with good leadership qualities, so that they are capable of meeting the greatest engineering challenges of 21st century. 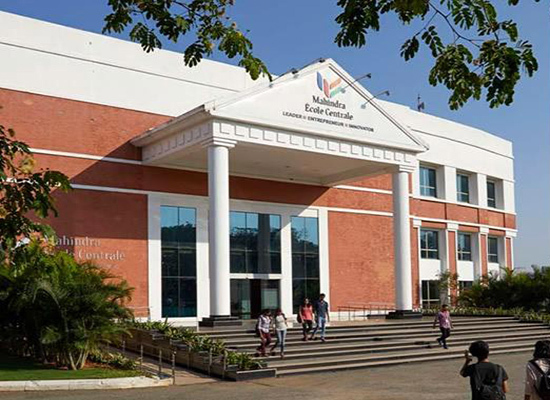 Mahindra Ecole Centrale (MEC) College of Engineering is an international technology school that marks the foray of the USD 20.7 billion Mahindra Group into the higher education sector.